There are a lot of artists that she could look to for inspiration. In spirit, her music is reminiscent of Lorena McKennitt and Shawn Colvin, which I mean in the very best way possible. Sara wrote all of these songs herself, and her instinct for mood and instrumentation is good. She aims for, and largely hits, a gypsy influence that plenty of other artists would have approached with too heavy a hand. (Think pointless accordion solos and finger cymbals.) Not only that, but she manages to be introspective without boring me to tears, no mean feat. However, where McKennitt and Colvin manage to invest movement and energy into even their quietest songs, Sara mostly limps along. When she does shake off the quietude, notably on “Kiss It Goodbye,” she fares much better. In fact, it’s a song like this one that gives me hope and keeps me from dismissing the album altogether. 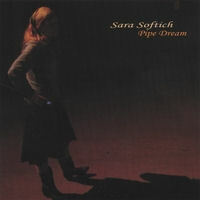 She definitely has something, but it’s still true that Pipe Dream is essentially a baby photo of Sara’s musical development – you can send it to friends and family, and they’ll coo encouragingly, but she definitely hasn’t grown up yet.